The use of Bayesian methods for the analysis of data has grown substantially in areas as diverse as applied statistics, psychology, economics and medical science. Bayesian Methods for Categorical Data sets out to demystify modern Bayesian methods, making them accessible to students and researchers alike. 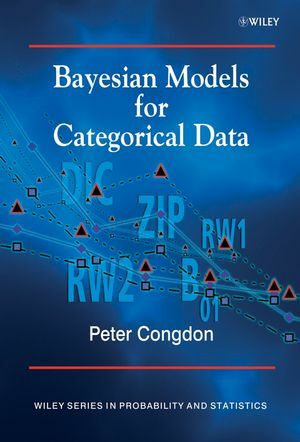 Emphasizing the use of statistical computing and applied data analysis, this book provides a comprehensive introduction to Bayesian methods of categorical outcomes. * Reviews recent Bayesian methodology for categorical outcomes (binary, count and multinomial data). * Considers missing data models techniques and non-standard models (ZIP and negative binomial). * Evaluates time series and spatio-temporal models for discrete data. * Features discussion of univariate and multivariate techniques. * Provides a set of downloadable worked examples with documented WinBUGS code, available from an ftp site. The author's previous 2 bestselling titles provided a comprehensive introduction to the theory and application of Bayesian models. Bayesian Models for Categorical Data continues to build upon this foundation by developing their application to categorical, or discrete data - one of the most common types of data available. The author's clear and logical approach makes the book accessible to a wide range of students and practitioners, including those dealing with categorical data in medicine, sociology, psychology and epidemiology. Peter is the author of two best-selling Wiley books on Bayesian modelling – Bayesian Statistical Modelling, and Applied Bayesian Modelling. Chapter 1 Principles of Bayesian Inference. 1.3 The basis for MCMC. 1.8 The normal linear model and generalized linear models. Chapter 2 Model Comparison and Choice. 2.1 Introduction: formal methods, predictive methods and penalized deviance criteria. 2.2 Formal Bayes model choice. 2.3 Marginal likelihood and Bayes factor approximations. 2.4 Predictive model choice and checking. 2.7 Penalized deviances from a Bayes perspective. 2.8 Multimodel perspectives via parallel sampling. 2.9 Model probability estimates from parallel sampling. Chapter 3 Regression for Metric Outcomes. 3.1 Introduction: priors for the linear regression model. 3.2 Regression model choice and averaging based on predictor selection. 3.3 Robust regression methods: models for outliers. 3.4 Robust regression methods: models for skewness and heteroscedasticity. 3.5 Robustness via discrete mixture models. 3.6 Non-linear regression effects via splines and other basis functions. 3.7 Dynamic linear models and their application in non-parametric regression. Chapter 4; Models for Binary and Count Outcomes. 4.1 Introduction: discrete model likelihoods vs. data augmentation. 4.2 Estimation by data augmentation: the Albert–Chib method. 4.3 Model assessment: outlier detection and model checks. 4.4 Predictor selection in binary and count regression. 4.6 Semi-parametric and general additive models for binomial and count responses. Chapter 5 Further Questions in Binomial and Count Regression. 5.1 Generalizing the Poisson and binomial: overdispersion and robustness. 5.4 Hurdle and zero-inflated models. 5.5 Modelling the link function. Chapter 6 Random Effect and Latent Variable Models for Multicategory Outcomes. 6.1 Multicategory data: level of observation and relations between categories. 6.2 Multinomial models for individual data: modelling choices. 6.3 Multinomial models for aggregated data: modelling contingency tables. 6.6 Heterogeneity via the mixed logit. 6.7 Aggregate multicategory data: the multinomial–Dirichlet model and extensions. 7.1 Aspects and assumptions of ordinal data models. 7.2 Latent scale and data augmentation. 7.3 Assessing model assumptions: non-parametric ordinal regression and assessing ordinality. 7.5 Structural interpretations with aggregated ordinal data. 7.6 Log-linear models for contingency tables with ordered categories. 8.2 Univariate responses: the mixed ICAR model and extensions. 8.5 Varying predictor effect models. Chapter 9 Time Series Models for Discrete Variables. 9.1 Introduction: time dependence in observations and latent data. 9.3 Parameter-driven dependence via DLMs. 9.4 Parameter-driven dependence via autocorrelated error models. 10.1 Introduction: clustered data and general linear mixed models. 10.2 Hierarchical models for metric outcomes. 10.3 Hierarchical generalized linear models. 10.4 Random effects for crossed factors. 10.5 The general linear mixed model for panel data. 10.9 Robustness in panel and clustered data analysis. 10.10 APC and spatio-temporal models. 10.11 Space–time and spatial APC models. 11.1 Introduction: types of missing data. 11.2 Density mechanisms for missing data. 11.4 Predictors with missing values. 11.6 Several responses with missing values. 11.7 Non-ignorable non-response models for survey tabulations.